Blue mussels (Mytilus Edulis) have a smooth, bluish-black shell. Wild blue mussels and tend to live in coastal estuaries or near shorelines. They often grow in clumps, attaching themselves to rocks or to each other by means of sticky filaments, sometimes referred to as a "beard". They are typically harvested by hand at low tide. In the North Atlantic, blue mussels are often grown using a variety of methods, but most methods share common traits, usually providing some means for mussels to anchor and live above the sea floor. Blue mussels inhabit a wide range of estuarine and marine environments. They attach to rocks, jetties and piers and sometimes form dense beds on sandy flat substrates. They can be found from the low tide level to a depth of 10 metres, and they prefer sites with significant water movement. Blue mussels have a minor spawning period in June, followed by a second, extended spawning period from August to January. Spawning occurs at water temperatures of 14°C. Blue mussels are "broadcast spawners" releasing eggs and sperm simultaneously into the water with fertilisation taking place in open water. The fertilised eggs are planktonic, averaging 0.07mm in diameter and develop into unshelled larvae within a day. Larvae are free swimming and the planktonic stage can last from 2 weeks to several months, although most larvae settle 3-4 weeks after spawning. Blue mussels are filter feeders, straining plankton from the water. They are preyed on by crabs, starfish, leatherjackets, pufferfish and flat worms. Did you know? he colour of the mussel meat varies slightly - the girls are pink and the boys are paler !! MUSSEL MYTH: Cooked closed mussels should not be eaten - Unopened mussels are just a nuisance to open because the mussel node has not released. There is no scientific or microbiological reasoning to suggest they should not be eaten. Don't waste them! Mussels are one of the most nutritious, convenient and value-for-money seafood delicacies available. Today, mussels are grown at 20 of the lease sites granted in Victoria's Port Phillip Bay. The mussels are grown on ropes in clean, flowing ocean currents and harvested at their peak condition. Unlike inferior dredged mussels dragged out of the mud at the bottom, Cultured Mussels are suspended metres above the seabed and are clean and free from sand and grit - so clean they need very little preparation. A small pea crab is sometimes found inside the blue mussel. It is not harmful to humans, nor does its presence mean that the mussel is dead or in poor condition. Farmed mussels usually have thinner shells than wild-caught mussels because they are usually farmed in relatively calm waters. Once popular as snacks that could be harvested free or purchased cheaply (and known as ‘poor man’s Oysters’), these filter feeders became a casualty of the Industrial Revolution as people became concerned about the quality of the water in which they were growing wild. Mytiliculture, as the cultivation of Mussels is known, was however one of the earliest forms of aquaculture, dating to at least 13th century France. A story tells of an Irishman shipwrecked on the western coast of France near La Rochelle who made a chance discovery that poles he erected in the mudflats to support nets for catching birds became a breeding ground for Mussels. So he drove in more stakes, closer together, and joined them with bundles of branches (‘bouches’) at low tide level and turned his hand to mytiliculture. The Mussels probably tasted better than the birds anyway! The process has been refined a little, but Mussels are still grown in France in virtually the same way on wooden hurdles called ‘bouchot’. The byssal threads, which mussels use to attach themselves to the substrate, should be removed before cooking. MUSSELS are high in protein and minerals and low in calories and fat. Mussels can be served cooked or cold, as part of a seafood platter, dipped into a spicy sambal and chilli sauces, added to paellas or, at the last minute, fish soups. Large mussels served in the half shell can also be stuffed and grilled. Blue Mussels are sold live. Look for brightly coloured, intact, lustrous shells, that are closed or close when tapped or gently squeezed, and a pleasant fresh sea smell. Tiny crabs are sometimes found inside Mussels, they are harmless and do not indicate any problem with the Mussel. Mussels need very little cooking and are ready virtually as soon as the shells open. If Mussels are being served in the shell, remove the beards before cooking by holding shells firmly closed and sharply tugging beards away from the pointy end of the shell; if Mussels are being removed from shells, cook with beards attached, they are easy to pull off the cooked Mussels once they’re removed from their shells. Lightly scrub shells with a plastic scourer to remove any sediment or barnacles. They have a rich, strong flavour, high oiliness and moist, juicy, medium-textured flesh. All of the flesh inside the shell is edible, females tend to be more orange in colour, whereas males are paler. Mussels yield an average of 30% meat, so allow around 600g of whole shells per person as a main course. Mussels work well with bacon, breadcrumbs, butter, celery, chilli, citrus, fennel, garlic, herbs (coriander, dill, lovage, parsley, French tarragon), mayonnaise, olive oil, onion, pepper, Pernod, potatoes, saffron, tomato, white wine. They lend themselves to a wide range of cooking styles, including steaming, poaching, deep-frying, stir-frying, baking, grilling, barbecuing (in the shell), smoking and pickling. Some connoisseurs even like the very fresh ones raw (sashimi), though this is rare. Due to their similarities, Blue Mussels often make a good substitute for Vongole, Pipis and other clams. The firm flesh works particularly well in soups, curries and stir-fries and they are often seen in cream or tomato sauces, fried, sautéed, au gratin (covered with herb and garlic butter and breadcrumbs and grilled until bubbling), in omelettes, soups, pasta, paella and salads. Blue mussels are an important commercial fishery. There are only small sectors still harvesting wild mussels. Most mussels are aquacultured, grown using long line methods, with sprat collected via natural settlement. All farmed product is sold live and whole in the shell. 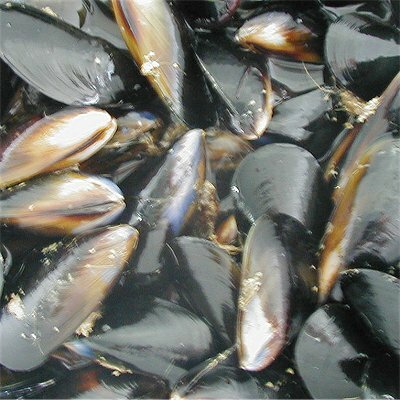 Mussels (or black Mussels), as they are the only commercial species of Mussel sold in quantity in Australia. They grow wild in intertidal waters to depths of around 20m, often in dense clumps, attached by coarse rope-like ‘beards’ (byssal threads) to exposed reefs, rocks and jetty pylons, and were traditionally harvested by divers off southern NSW, Victoria, SA and southern WA. Wild Mussel harvests have been in decline, however, since aquaculture commenced in NSW in 1976, and now all Blue Mussels sold commercially are farmed. They are grown in southern NSW (around Eden), Victoria, Tasmania, SA and southern WA in clean, sheltered water 5-20m deep. During spawning, Mussels produce up to 8 million tiny eggs (0.07mm in diameter), which float on the currents for up to 3 months before settling. The tiny immature Mussels (spat) are collected on ropes (mainly from the wild, although some are produced in hatcheries in Tasmania) and raised in long ‘socks’ (to protect them from predators) suspended from horizontal ropes attached to buoys to keep them immersed (known as subtidal suspended culture). They are harvested at 12-18 months, when they average 6-9cm and 25-40g (although they can grow to almost 13cm and 50g) and are available year round. 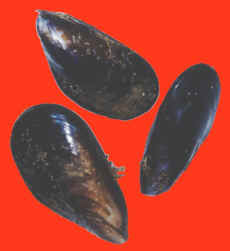 The smooth dark, wedge-shaped shell (usually bluey-purple to black, but occasionally browny-grey,) with a bluish-white interior is easily distinguished from other bivalve molluscs such as Oysters, Pipis and Vongole. Suspension aquaculture systems are the most common method of growing blue mussels. Typically, farms employ a network of horizontal lines suspended in the water from buoys from which ropes or lines called droppers are hung. The larvae or spat attach themselves to the droppers and grow. Blue mussels reach market sizes in 1-2 years. They feed by filtering 10-15 gallons of water a day. The traditional French 'bouchot' method of mussel culture originates from the 13th century. According to legend, an Irish traveler was shipwrecked on the Mont Saint Michel Bay when he accidentally discovered the habit of mussels to aggregate on ropes and fatten remarkably . The culture method was named by a combination of two words in the Irish of the time: Bout=fence, Chot=Wood. The bouchot method of mussel farming is implemented on wooden poles which are placed upright into the sea bed in the low inter-tidal region. Mussels in Galicia (Spain) are farmed using "Batea" - a floating platform made of eucalyptus beam fastened on top of barrels or floaters and anchored to the sea bed by means of concrete block called "muertos" (dead). In 2010, there were more than 3,300 bateas in the estuary waters of Galicia, producing almost half of the EU production. Western Australian Fisheries - Publications and information on popular freshwater and saltwater aquaculture species: Ornamental Fish, Silver Perch, Black Bream, Red Claw, Trout, Yabbys, Marron, Mussels, Pearls, Western Rock Lobster, Trochus, Abalone, Barramundi, Fin Fish, Prawns.